A Home Equity Line of Credit is a revolving line of credit and works a lot like a credit card, where you can use it when you need it and make payments on the unpaid balance but at the same time giving you a much lower interest rate. A HELOC useds the equity you have in your home as collateral. Call one of our Member Service Representatives today for more information and to start your application process at 440-997-5919, Ext. 2. Apply online for a HELOC. You can also schedule a free appointment with one of our Certified Financial Counselors. 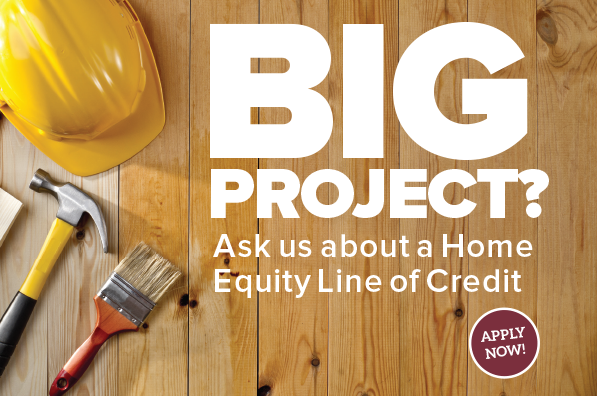 *Approval for a CFCU Home Equity Line of Credit is subject to meeting established credit criteria. Must be an existing Member or become a Member of the Credit Union to obtain a loan. Certain terms and conditions apply. Credit is Subject to approval. Consult a tax advisor regarding the deductibility of interest. CFCU products, services, terms and prices are subject to change. Annual Percentage Rate: Annual Percentage Rate (APR) shown was available as of March 25, 2016 to well qualified applicants for variable rate lines of credit up to $250,000 secured by single-family owner occupied residential property. Your APR may be higher and will be based on the current Wall Street Journal Prime Rate, your credit qualifications, the amount of the line, loan-to-value, and property type. APRs currently range from Wall Street Journal Prime Rate, to Wall Street Journal Prime Rate plus 1.00% for a Home Equity Line of Credit. Annual Fee: There is a $35 annual fee. Account Opening Fees: There are no fees to open a Home Equity Line of Credit. Early Termination Fees: There is no early termination fee. Property Insurance: You are required to carry property insurance on the property that secures your account. Flood insurance may be required. Your payments on this account do not include taxes or insurance. Call or stop in to obtain product information and current rates. APR is variable.